"Animals are such agreeable friends - they ask no questions, they pass no critcisms." 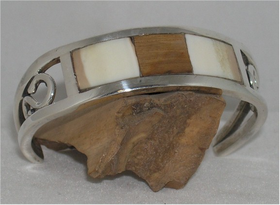 Our Filigree Bracelet is made from a central rectangular piece of Dark Fossil walrus Ivory, set between two pieces of Fossil walrus ivory, each of whose color transitions from light to medium Tan. A filigree fills the gap between the bracelet sides. As an added option, we can change the center piece of dark Mammoth ivory to Rare Blue Fossil Walrus Ivory. Please measure completely around wrist when sizing.